Veneers are very much like crowns and are permanent. The difference is that veneers are extremely thin shells and all porcelain which are strong and stain resistant. 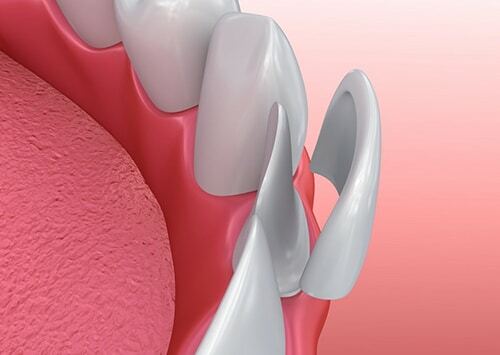 They are placed on the visible surface only and the preparation of the tooth is very minimal. A shade or colour match is taken to ensure that the veneers match perfectly with your neighbouring teeth. An impression is taken and is sent to our lab where the veneer(s) are made. The process takes just two appointments over one week. Veneers can be shaped and sized to make teeth appear straight, fill in spaces between teeth and cover up stained enamel to make your smile look perfect.